The estate features an incredible building that was built by Cimicky himself and has lovely formal gardens that are always manicured. Karl's son Charles took over the family business and renamed it for himself, hence the name on the bottle now. In the early 90s Charles began to take a keen interest in winemaking and the good wines started turning into awesome wines. Charles Cimicky produces rich, voluptuous, generous wines with superb balance. Now in his late thirties Charles Cimicky is one of the most quality-driven, meticulous winemakers in South Australia. Charles Cimicky is fastidious. 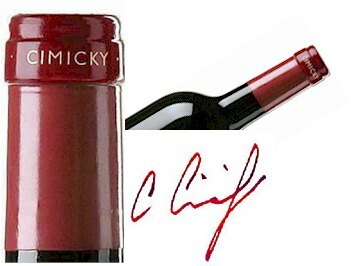 The winery is completely air-conditioned and individually temperature-controlled tanks are employed in the making of all Cimicky wines. Updated technology includes the unse of a membrane press and rotary fermenters. The Cimickys also have their own bottling and packaging line which is a rarity in a winery of this size. Charles Cimicky winery and vineyards are located one kilometer along the picturesque hermann Thumm Drive in Lyndoch, on the very floor of the Valley, surrounded by the beautiful Barossa Ranges. Apart from minor drip irrigation in January and February, the entire 32 hectares of vines are dry grown, cover-cropped and organically fertilized. The fruit is aged only in top quality oak which is apparent in the finegrained tannins evident in all of their premium wines. The Trumps range is named after the custom of a small group of Barossa pioneers whose habit was to seek the cellar retreat for the twin pleasures of claret and cards. In the cool depths of this refuge they would while away a hot summer's day playing Euchre and drinking red wine, well away from the prying eyes of more puritanical souls. Originally the wines were marketed under the Karlsburg label.